Syrian government forces shelled a village in a rebel-controlled area near Damascus on Sunday, killing at least 12 civilians and injuring several others who were taking shelter in a banquet hall. The violence in the water-rich Barada Valley, which has raged since Dec. 22, has tested the country's fragile cease-fire and restricted the flow of water to the capital. Despite an agreement to allow maintenance workers in to fix the water facility in the rebel-controlled valley, the violence continued, also trapping an estimated 100,000 residents. On Sunday, shells fell on al-Reem banquet hall in Deir Qanoun village in the valley that houses hundreds of civilians who had escaped the intensified fighting. The activist-operated Wadi Barada Media Center said 12 were killed and more than 20 were injured. The group posted pictures of the bloodied floors of the hall, some of them showing bodies with severed limbs. In a video posted by the opposition Step News agency, a civilian in the hall said the shelling killed his wife, daughter and niece. The distressed man called for help as he tried to piece together the bodies of his killed family. "Their flesh was torn apart, so if there's someone to help us out," the man said as he walked away from the camera. There were signs of massive destruction in the hall, with furniture broken, walls destroyed and blood stains on the tile floors. Fuad Abu Hattab, an exiled resident of Barada Valley and an activist with the group, said medical teams have been unable to move around the valley because of the fighting and it is not clear if the dozens of injured are getting any immediate care. Abu Hattab said the center has served as a shelter for many displaced civilians who escaped the ongoing violence in the valley and other parts of rural Damascus. The hall has an area for weddings, as well as a restaurant and a number of rooms. It had largely been spared the intense fighting, Abu Hattab said. The Syrian Civil Defense, a team of volunteer first responders in the rebel-held parts of Syria, also put the death toll at 12, saying the shelling hit a displaced people's center. Britain-based Syrian Observatory for Human Rights put the death toll at seven but said it was likely to rise because some of the injured are in critical condition. Fighting has raged in the valley that provides the Syrian capital with most of its water supply. In recent days, government and allied troops have been advancing in the valley despite talks to stem the violence. The Lebanese Hezbollah group, which has fighters on the side of the Syrian government, said pro-government troops seized a hill overlooking the water source in the valley Sunday. Meanwhile, in eastern Syria, Islamic State group militants kept up their offensive on government-held areas of the contested city of Deir el-Zour, attacking a military air base from several fronts. The group said in statements posted on social media it attacked the airport from the west Sunday, seizing a sentry base used by government soldiers there. The Observatory said the group's militants also advanced on a hill overlooking the city. If it secures the hill, the Observatory said, IS militants would be able to sever the road between the air base and another army base nearby. Deir el-Zour carries strategic significance for IS as it links the group's Iraq territory to its de facto capital of Raqqa in Syria. The group is under intense pressure in both countries and has lost significant territory in recent months. The extremist group, which controls most of Deir el-Zour province, has kept the provincial capital under siege since 2014. The new multi-pronged assault that began Saturday is its most intense attack on government areas since January 2016. Government forces have withstood the encirclement thanks to air-dropped humanitarian assistance and weapons and ammunition flown into the airport. Remaining residents have reported malnourishment and starvation amid severe shortages of food, water and fuel. Syrian opposition activists say government shelling has struck a village in a rebel-controlled area near Damascus, killing at least seven civilians and injuring several others, in violence that has tested the country's fragile cease-fire. 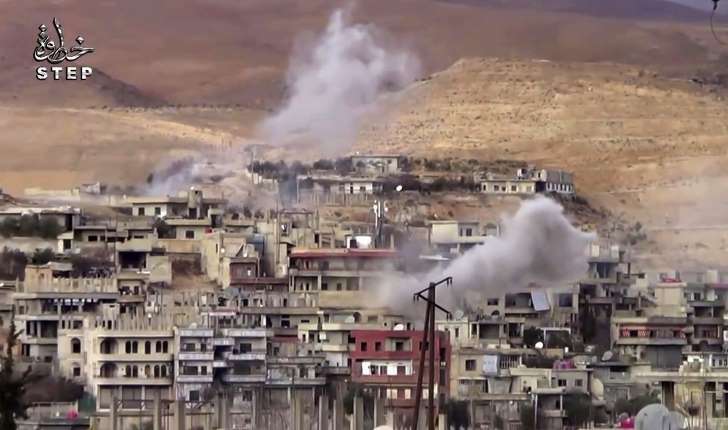 The Britain-based Syrian Observatory for Human Rights says shelling Sunday in Deir Qanoun village in the water-rich Wadi Barada valley killed at least seven and injured more than 20, some in serious condition. Activist-operated Wadi Barada Media Center put the toll at 12. Fighting has raged in the valley that provides the Syrian capital with most of its water supply, restricting the flow since Dec.22, despite talks to stem the violence. Lebanese Hezbollah group, which has fighters on the side of the Syrian government, said pro-government troops seized a hill overlooking the water source in the valley. 0 Response to "Syrian opposition: Shelling of displaced shelter kills 12"